EP-30D Hydraulic Compression Tools: Izumi Products. 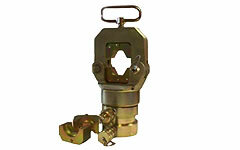 The EP-30D is a double acting hydraulic compression head that has hydraulic ram advance and retract. It requires a double acting pump operating at 700 bar (10,000 PSI) out put and 200 bar retraction. Lightweight design for easy overhead compression work. Yoke type head for easy die and connector access. When ordering dies please specify the manufacturers die and connector numbers.